I won fiber in a door prize at the Kitchener-Waterloo Knitter's Fair last year: 250g of hand-dyed Polwarth, which I hoped one day to be skilled enough to spin. A week in to the Tour de Fleece, I've spun it. Not expertly, but more consistently than when I started, so it'll do. When I got it out of its bag it looked like a giant squid, which is what I named it when I first plugged it into Ravelry. 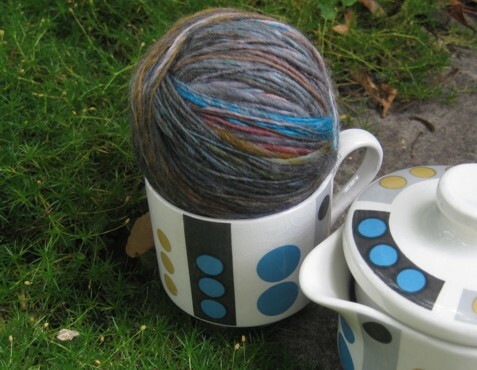 But when I spun up the first of the four lengths I tore from it I saw the colours matched my vintage coffee set whose pattern is called Midwinter. 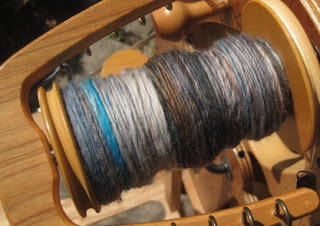 I spun the first two strips in one day because I Could. Not. Restrain. Myself. but then of course my wrist hurt from all the tugging and pulling to draft it at the wheel. 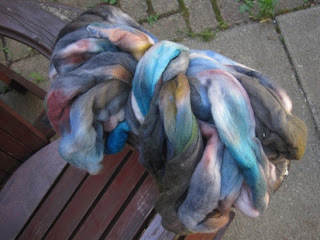 I'd been spinning superwash merino for a few days, you see, and Polwarth is a bit stickier, especially if 250g of it have been dyed and then compressed into a bag. Looking at the other two I decided to pre-draft by pulling the fibers wide, not out. I don't think you could top this for a sofa cushion or cat bed, do you? 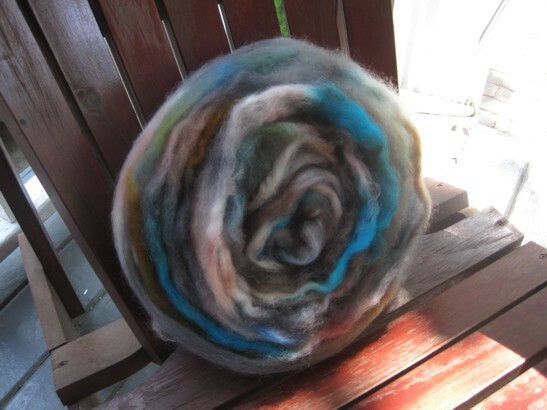 I'm almost tempted to draft out the rest of my fiber like that and just leave it around as home decor, but there's still a lot more Tour to go and I have to spin something. The other singles looked pretty much like the first, okay on the surface but full of little mistakes that revealed themselves in the plying. Like for example, tearing dyed fiber into strips so as to produce solid patches of colour in the ply only works if the strips are exactly the same width, and if the singles are spun in exactly the same size. Otherwise, you get a whole lotta barber pole effect. 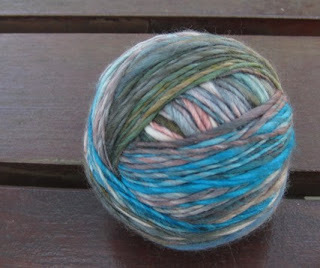 Fortunately I like barber poles, and bulky barberishness is a big step up from mangled shreds of roving. Bonus: I learned enough in Midwinter to be doing a little better still with Foxymaple up in the corner there. I'll tell you about that one later in the week. In the meantime - have a great Monday! I love barberpole yarns- they knit up very tweedy looking. 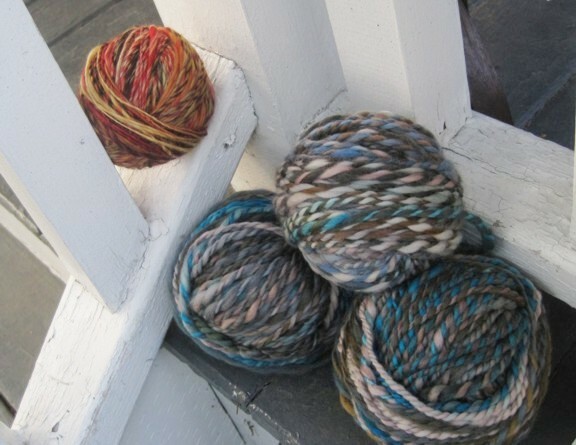 You don't want all that yarn just ship it all to me :D.
It looks amazing. I love the colors, like a crisp mountain day or something.